It doesn’t look like much, does it? A scrap of iron, a couple of pieces of wood. 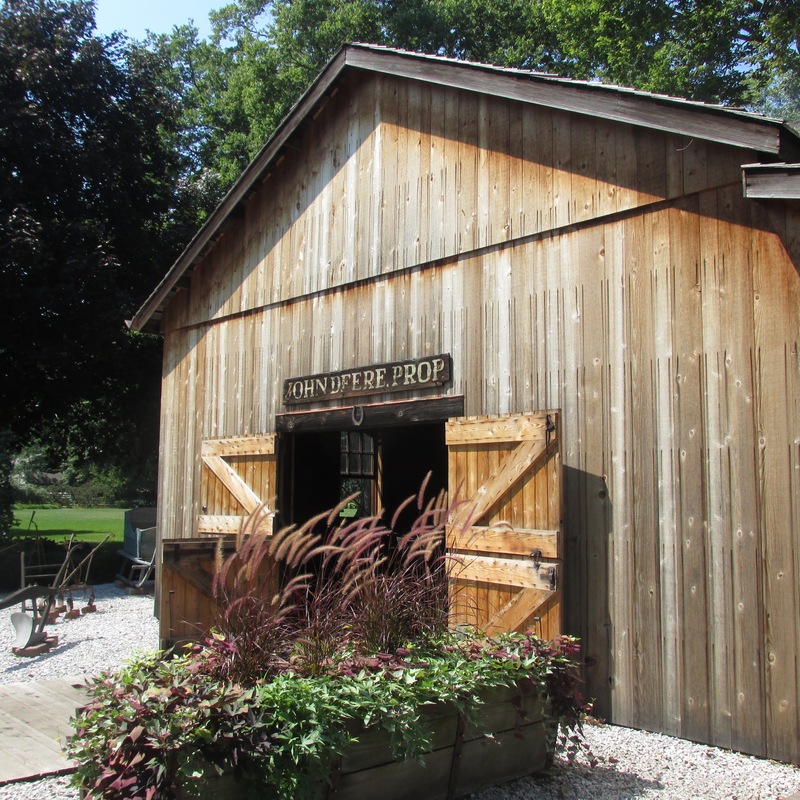 At the John Deere museum in Grand Detour, IL, you may listen to the story of a tailor turned blacksmith who changed the destiny of prairie. 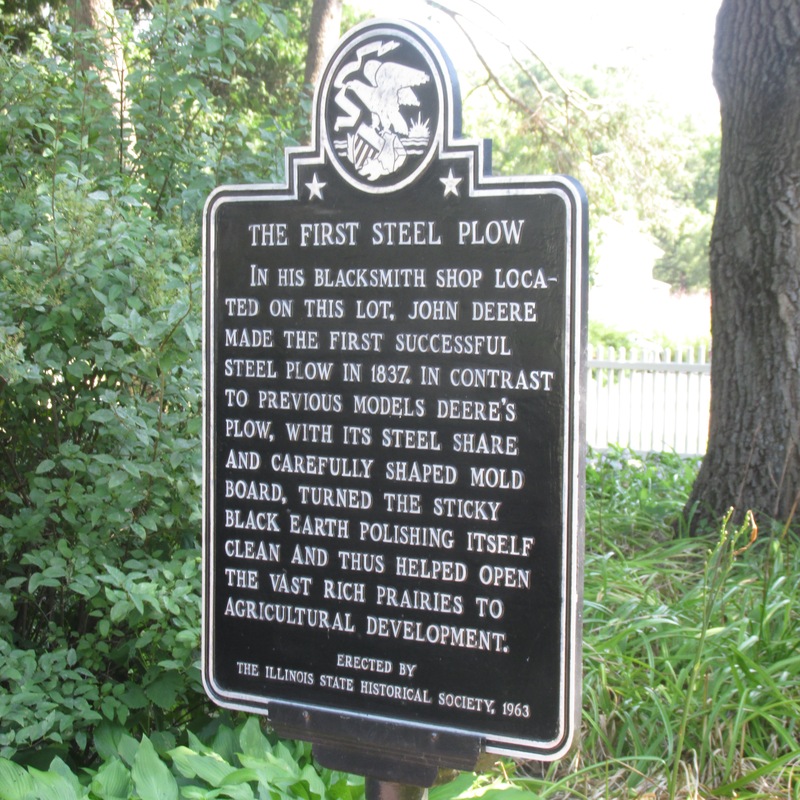 The site is owned by the John Deere company, so the spin is positive: John Deere, you’ll hear, “opened up” the prairie to agriculture with his invention of the steel plow. And that he did. Millions of acres of rich, Illinois sod which had resisted the cut and tear of older, less efficient plows, turned over and gave up the ghost in the wake of Deere’s invention. Families struggling to make a hardscrabble life on the prairies of Illinois and the Midwest sang the praises of the new plow. It’s impossible for us to realize what a godsend it was for our early settlers, trying to make a new life in a new land. Trying to feed their families. Trying to make a fresh start. The wheels of John Deere’s imagination must have turned quickly. 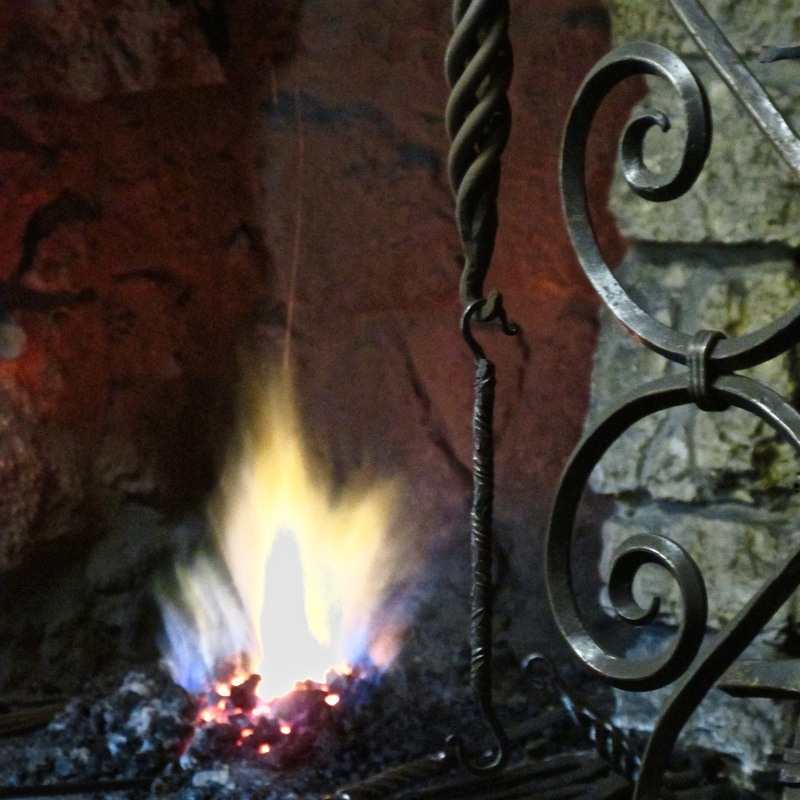 He heated his irons; forged his steel plows. One or two, then twenty. Two hundred. The future was bright for farmers. John Deere was a hero. Perhaps the losses weren’t noticeable at first. 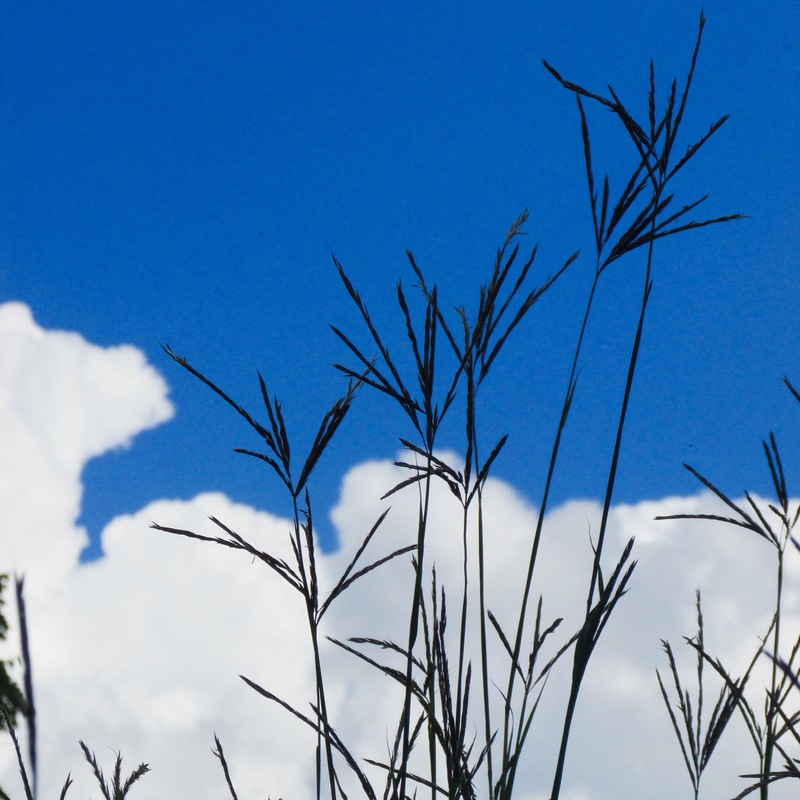 Big bluestem no longer waved against a brilliant sky. 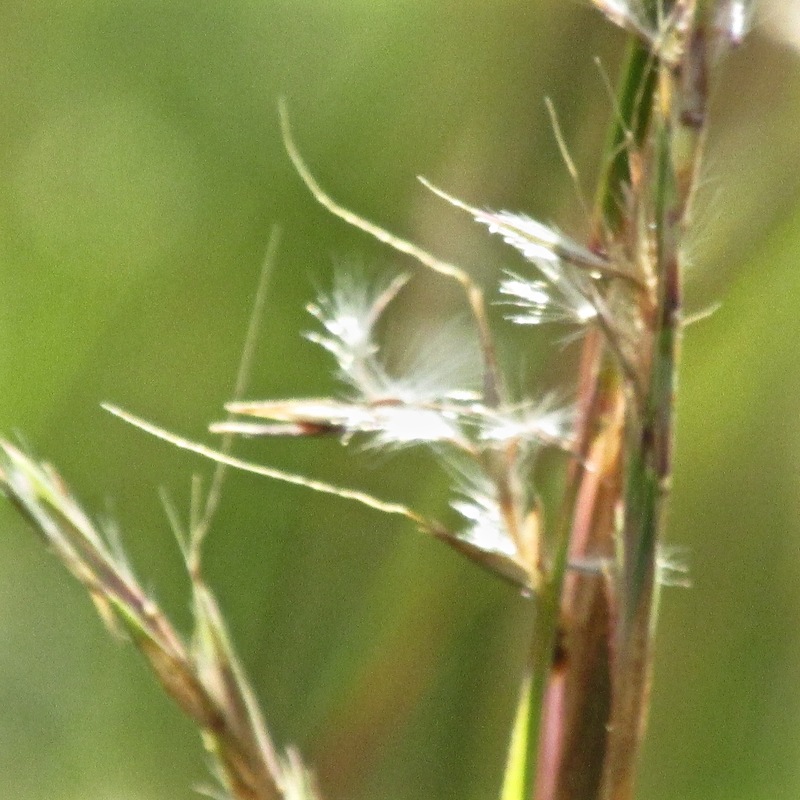 Little bluestem’s puffs of cottony seeds disappeared with the wind. 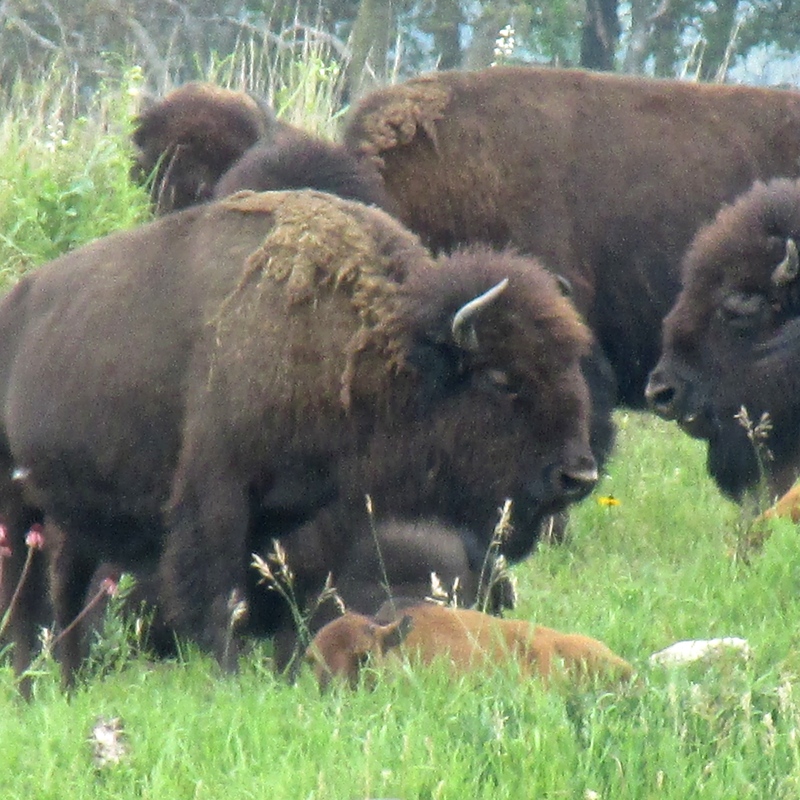 Bison moved west, hunted almost to extinction. 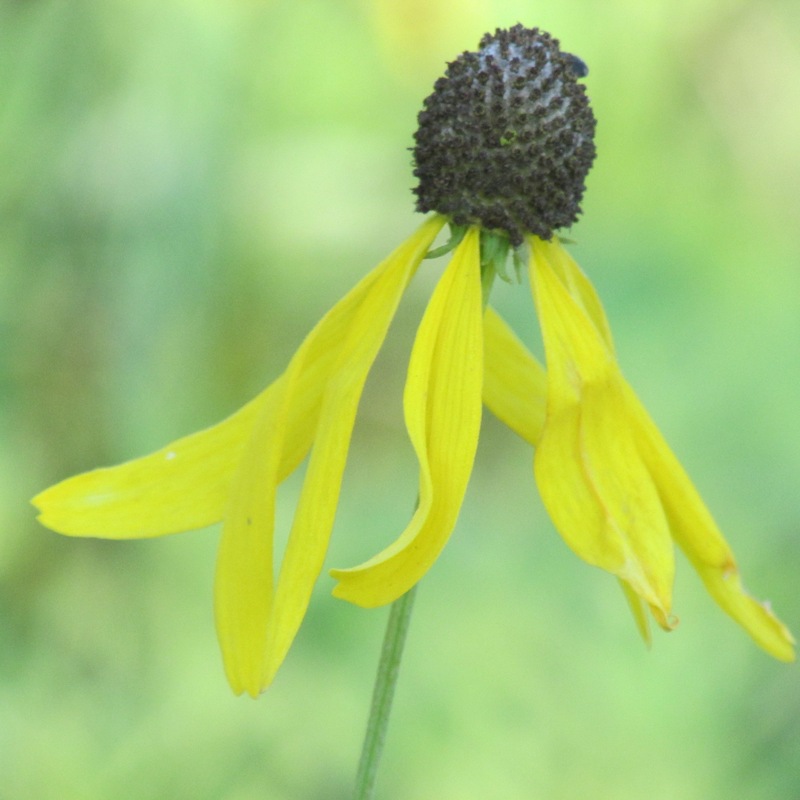 Where Indian grass once shed its confetti of yellow petals, corn tasseled out. So many different flowers. Where did they go? 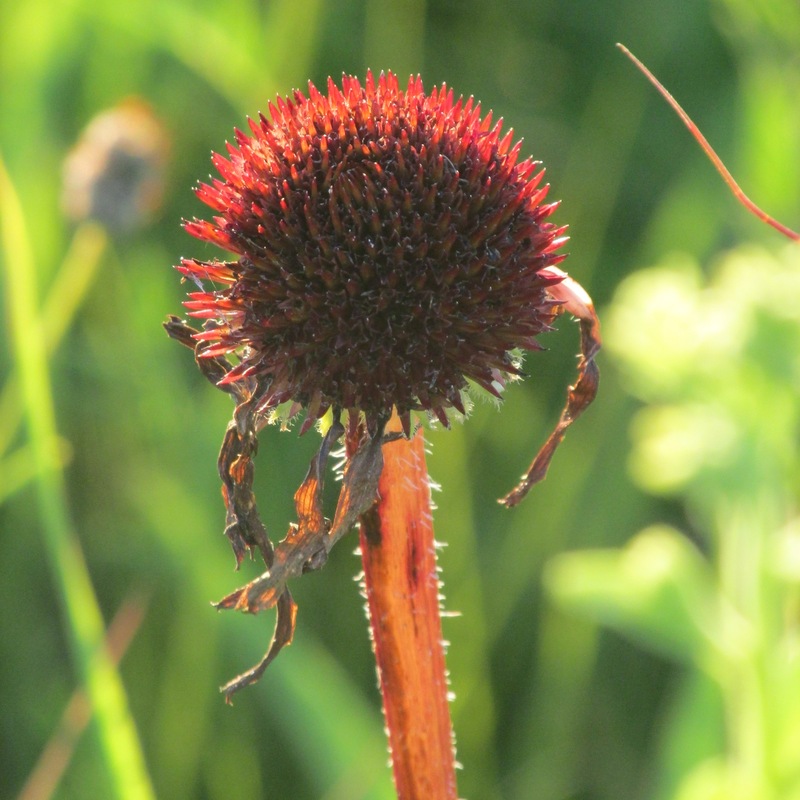 Their seeds persisted for a while, then vanished. If you would have known what we know now, John Deere, would you have taken that scrap of saw blade, tinkered with it in your shop, and changed our prairie landscape forever? Perhaps. You made some money, paid off your debts, fed and housed your family. Made a good life for yourself. Isn’t that what most of us try to do? 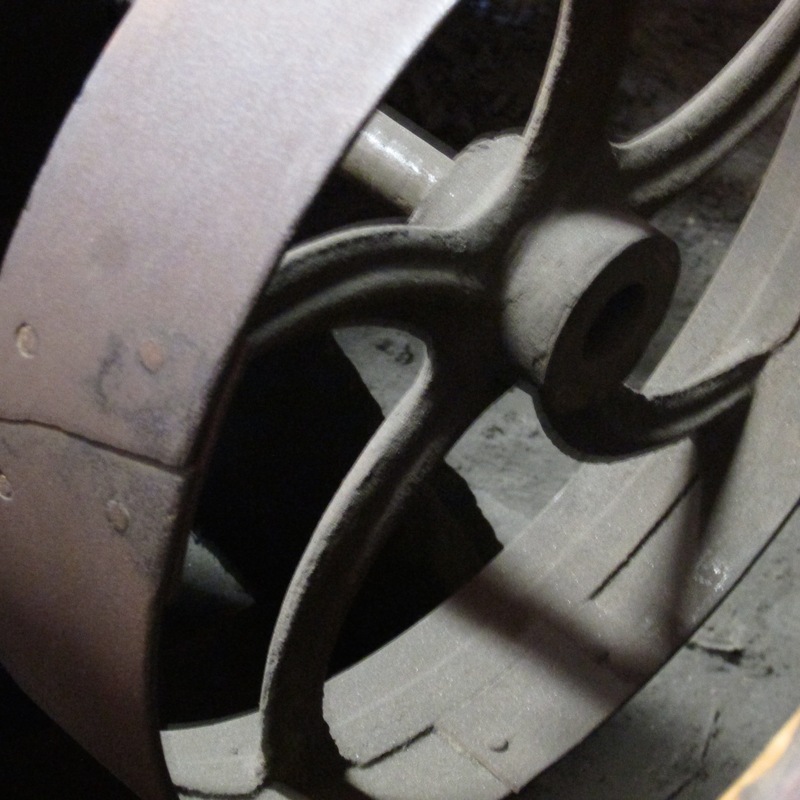 When our technology leaps ahead of our wisdom, sometimes losses accrue that we don’t yet know are losses. But those who follow us — our children, our grandchildren, our great-grandchildren — will be left to count the cost. Oh, John Deere. The decisions you made— the road you took— to better the lives of your generation for good has had outcomes you couldn’t imagine. May we have wisdom to see how our choices may influence the future. 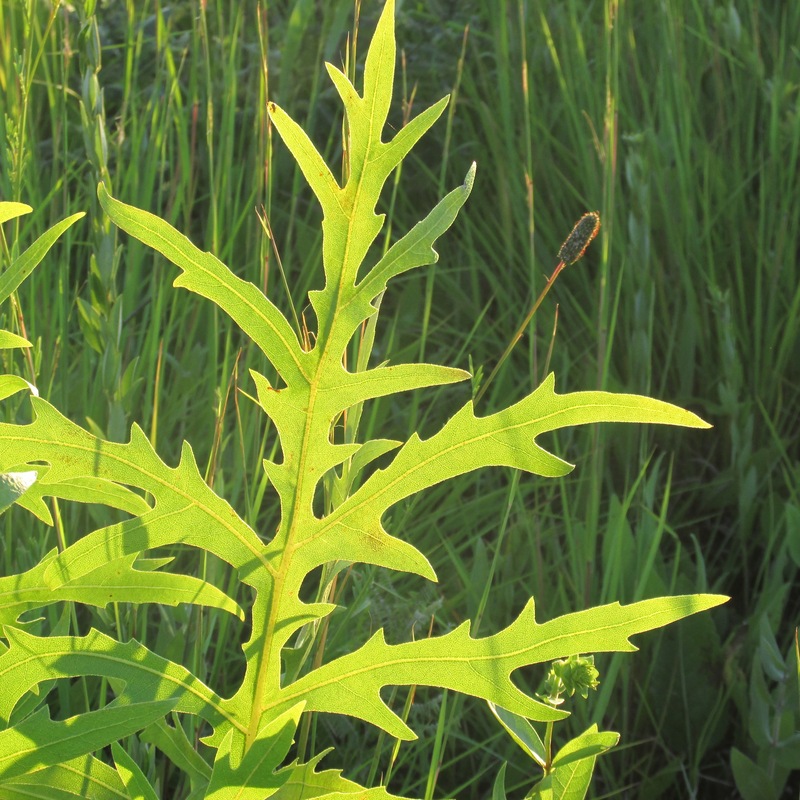 One of the first prairie plants I learned the name of and remembered was the compass plant. 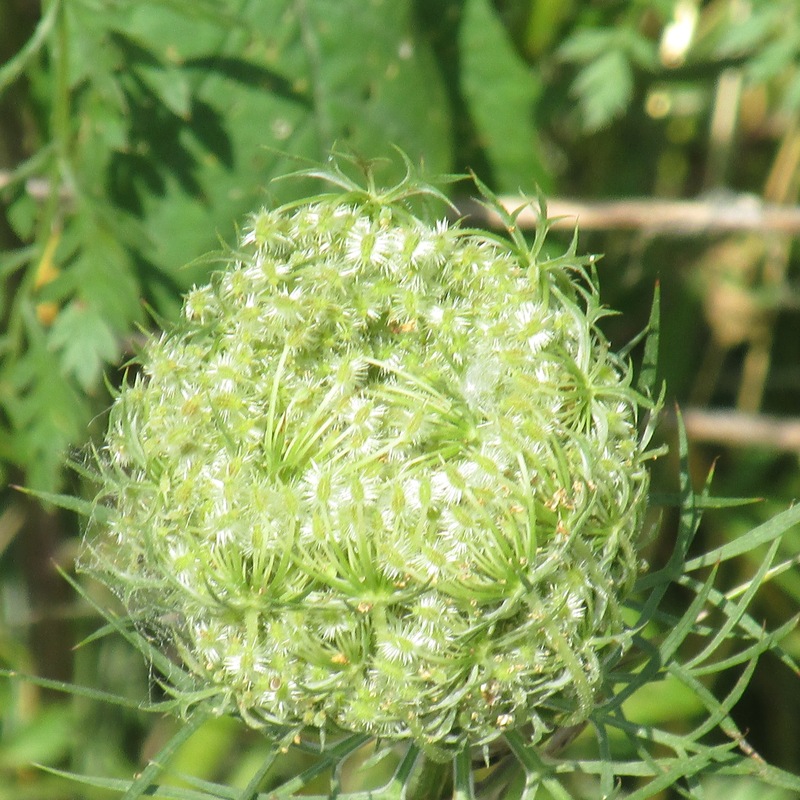 It towered over my head in August– unmistakable! Identifying it gave me the confidence to learn the names of other prairie inhabitants. 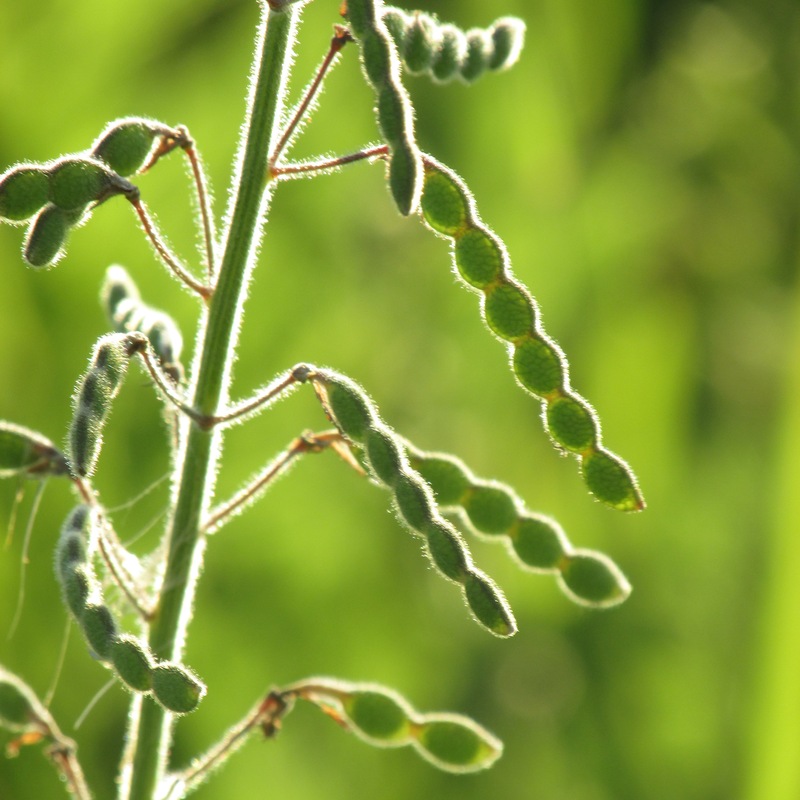 The compass plant’s name refers to the leaves, which point loosely north and south. 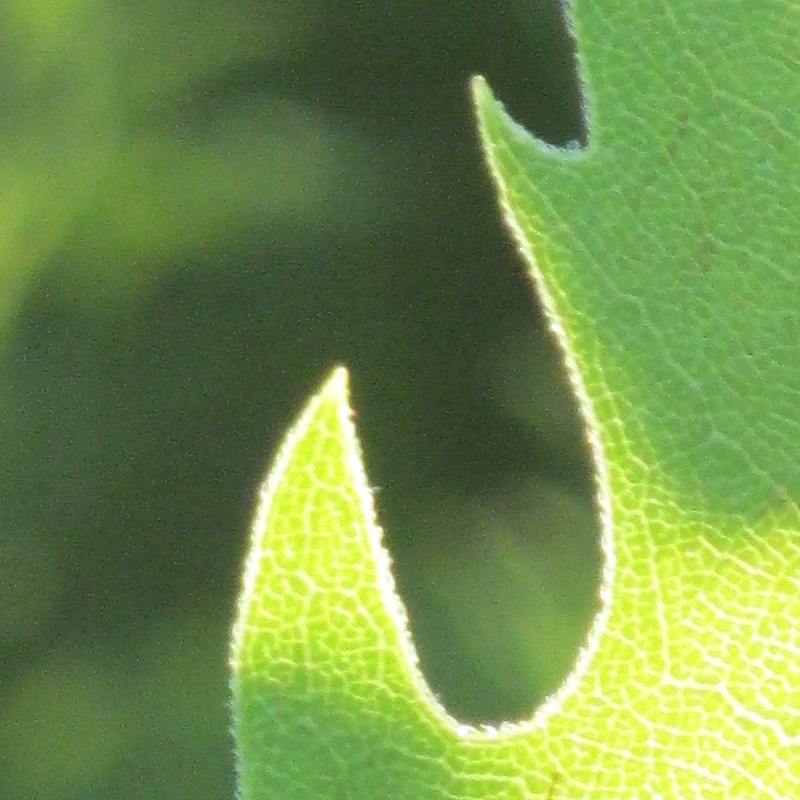 It’s an adaptation to help the leaves retain moisture during Illinois droughts. Smart plant. 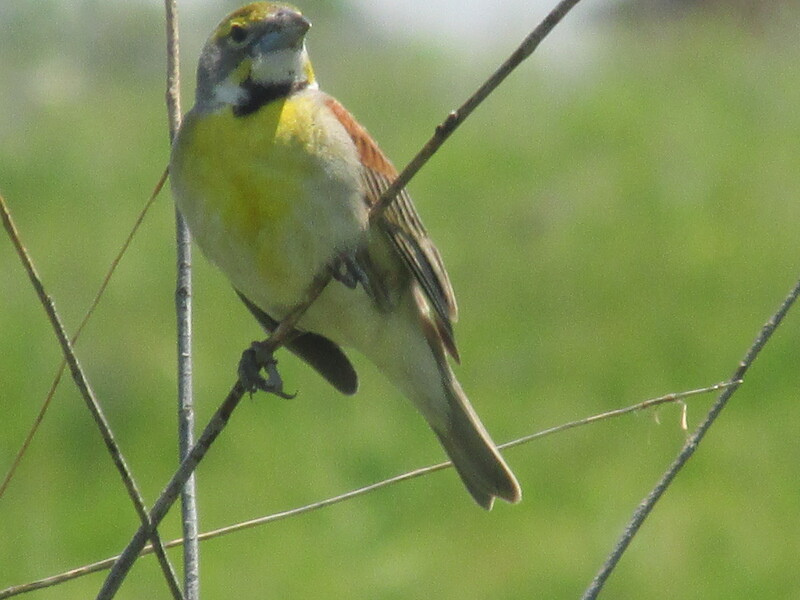 The tall, old woody stems are a favorite dickcissel perch. 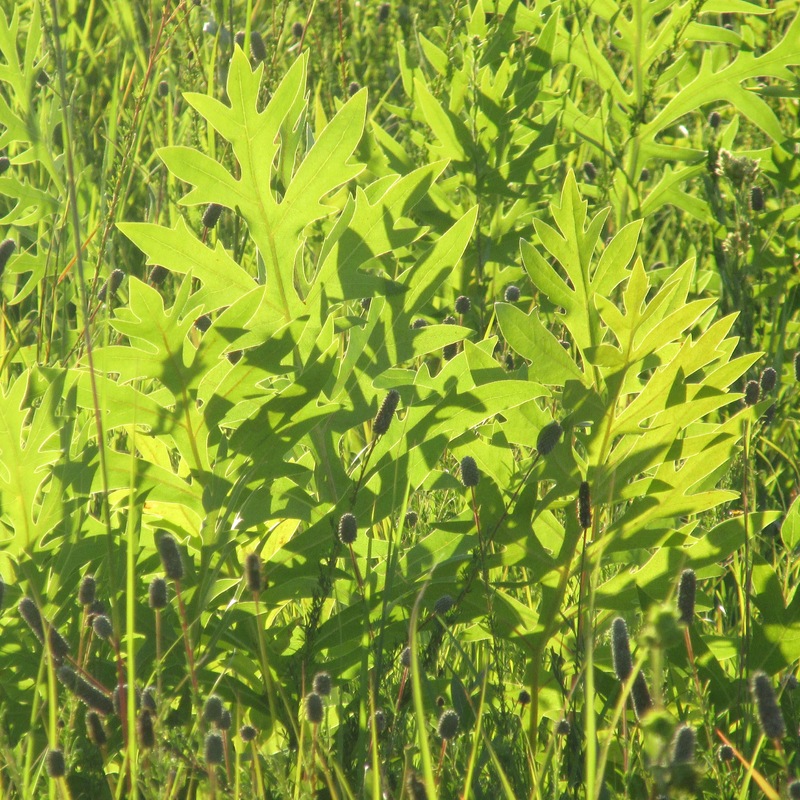 I wouldn’t want to rely on compass plant leaves as a true compass if I needed to get somewhere. But I’m taken with the notion that this plant knows something about finding your way home when you’re lost. 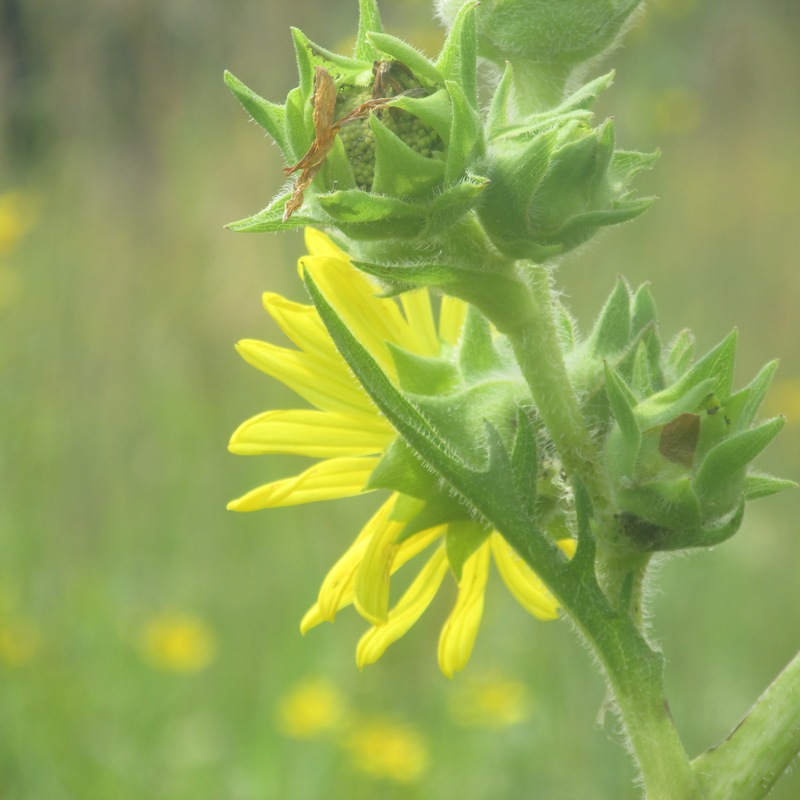 In A Sand County Almanac, Aldo Leopold writes about finding a compass plant, Silphium laciniatum, tucked into an unmowed patch of tallgrass in an old cemetery. 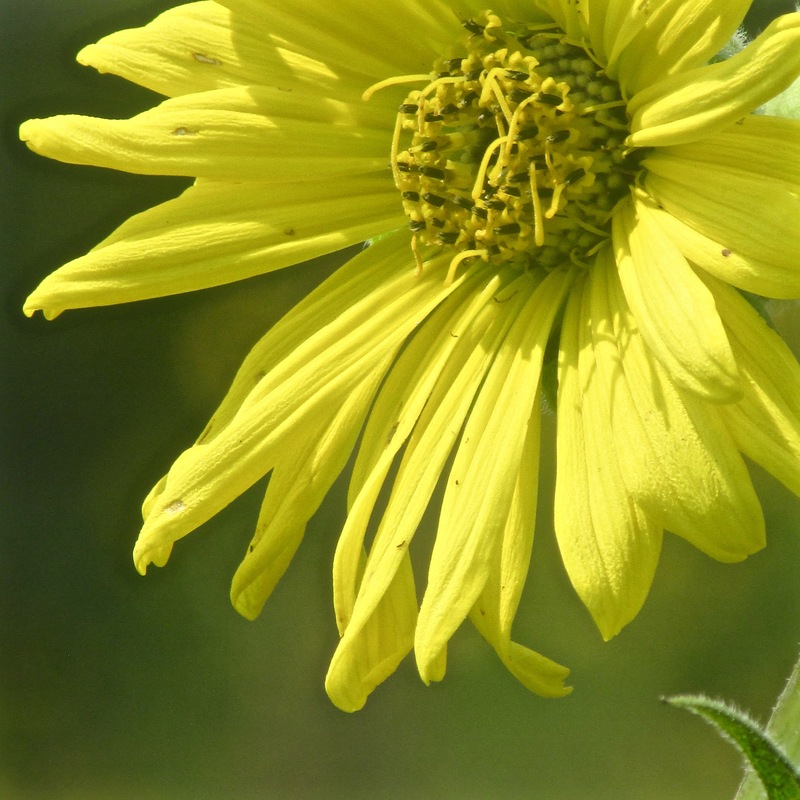 He wrote: Heretofore unreachable by scythe or mower, this yard-square relic of original Wisconsin gives birth, each July, to a man-high stalk of compass plant or cutleaf Silphium, spangled with saucer-sized yellow blooms resembling sunflowers. 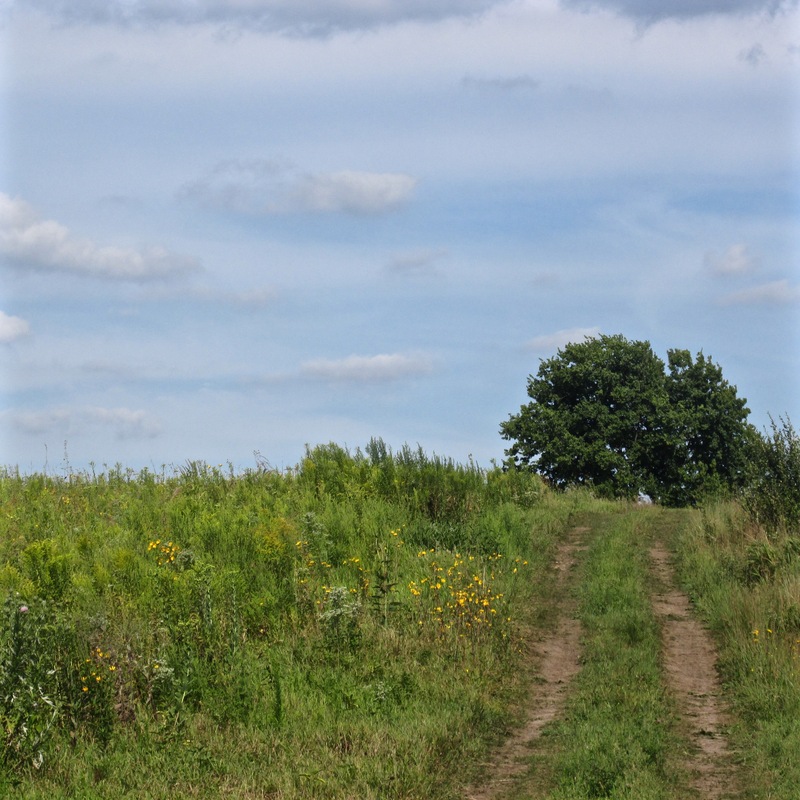 It is the sole remnant of this plant along this highway, and perhaps the sole remnant in the western half of our county. 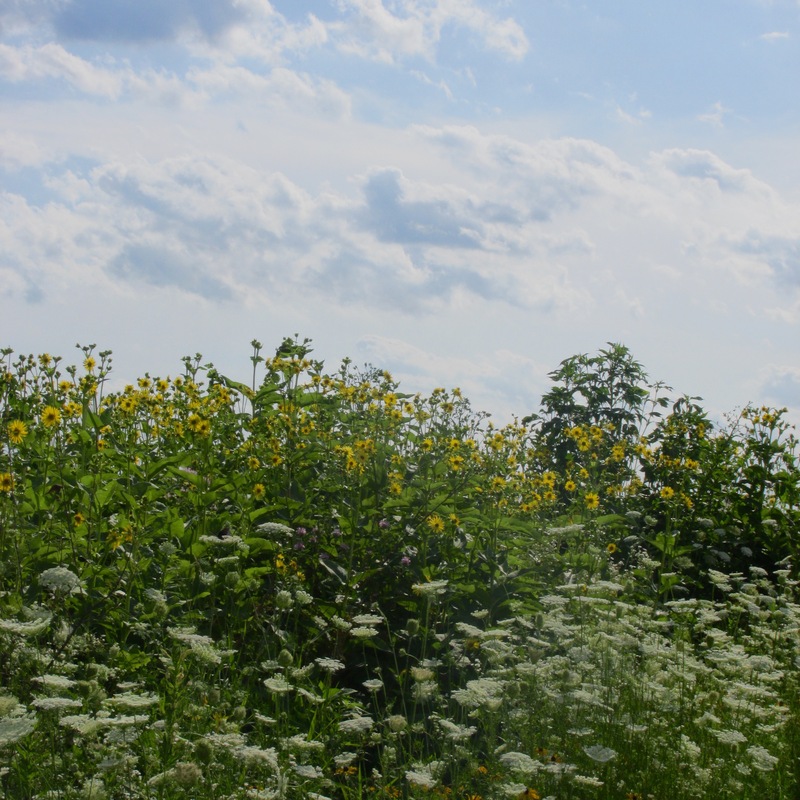 Leopold continued: What a thousand acres of Silphiums looked like when they tickled the bellies of the buffalo is a question never again to be answered, and perhaps not even asked. 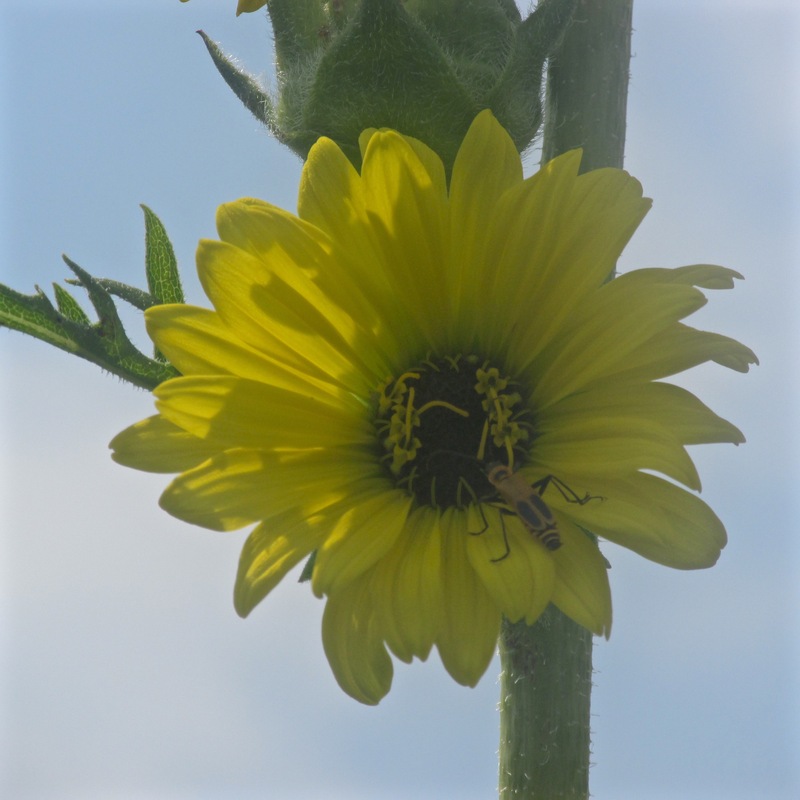 Isn’t it ironic that a compass plant, named for its ability to show the way forward, symbolizes something we’ve lost? 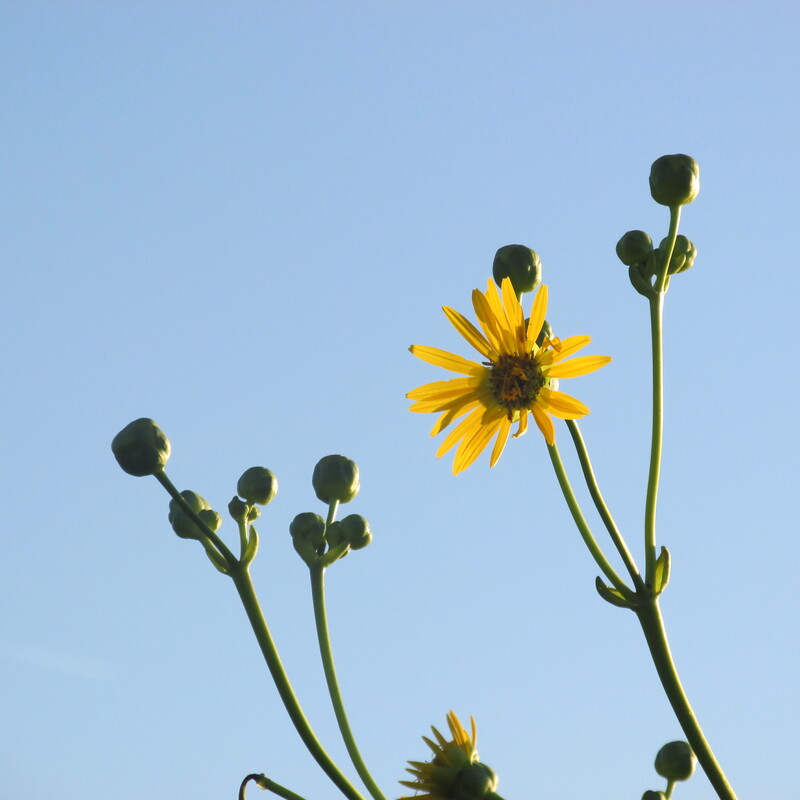 Whenever I see the compass plants, towering over my head in August on the prairie, I’m grateful. 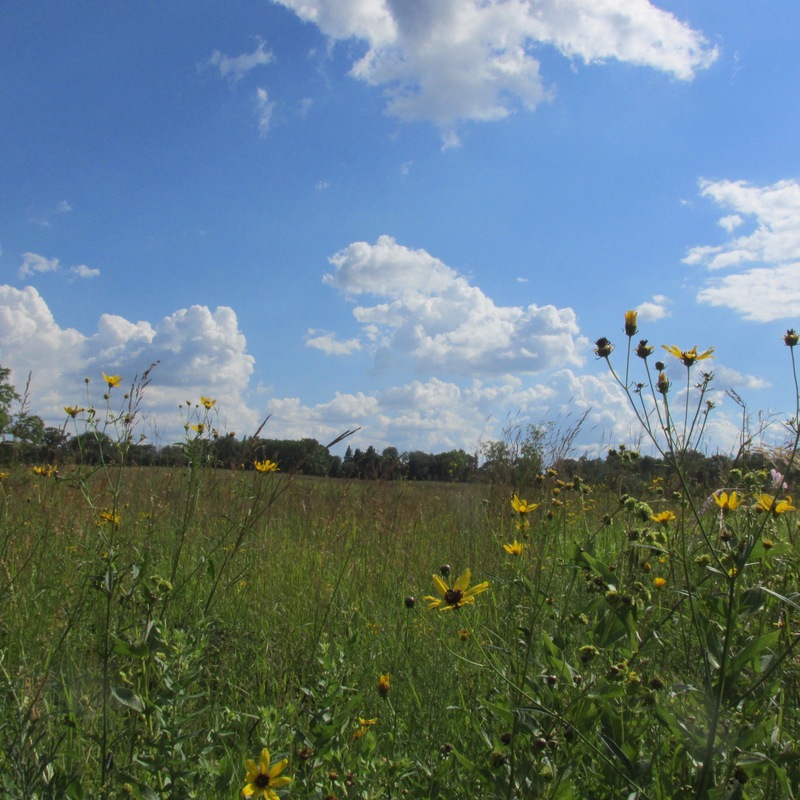 Grateful for Aldo Leopold who gave us motivation and direction to move forward with restoration. 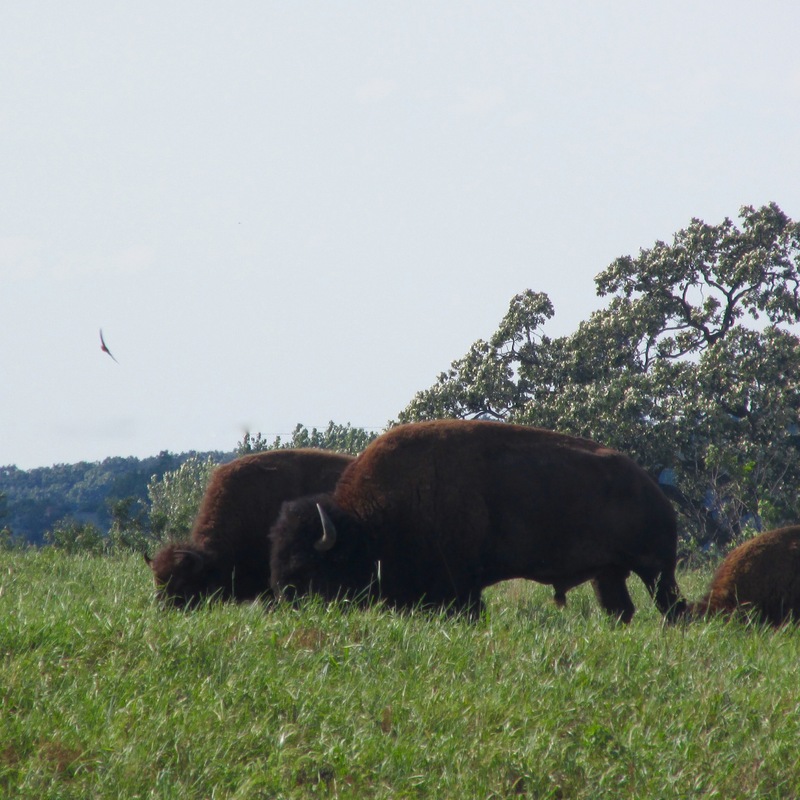 Grateful we have some of these plants —that once tickled the buffalo bellies— left to admire. 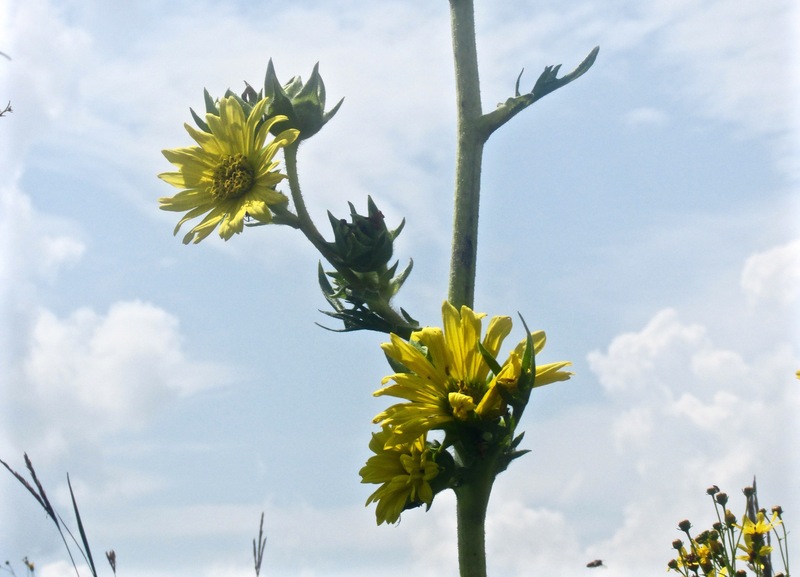 I’m reminded that the compass plant points the way forward: To a future filled with the hope of restoring a wounded and broken world. No matter how hopeless that effort sometimes seems. Every small step forward, each action we take toward healing what is broken, makes a difference. Quoted text is from Aldo Leopold’s classic A Sand County Almanac (1949). What about that plant? Should I pull it? It was a good question. 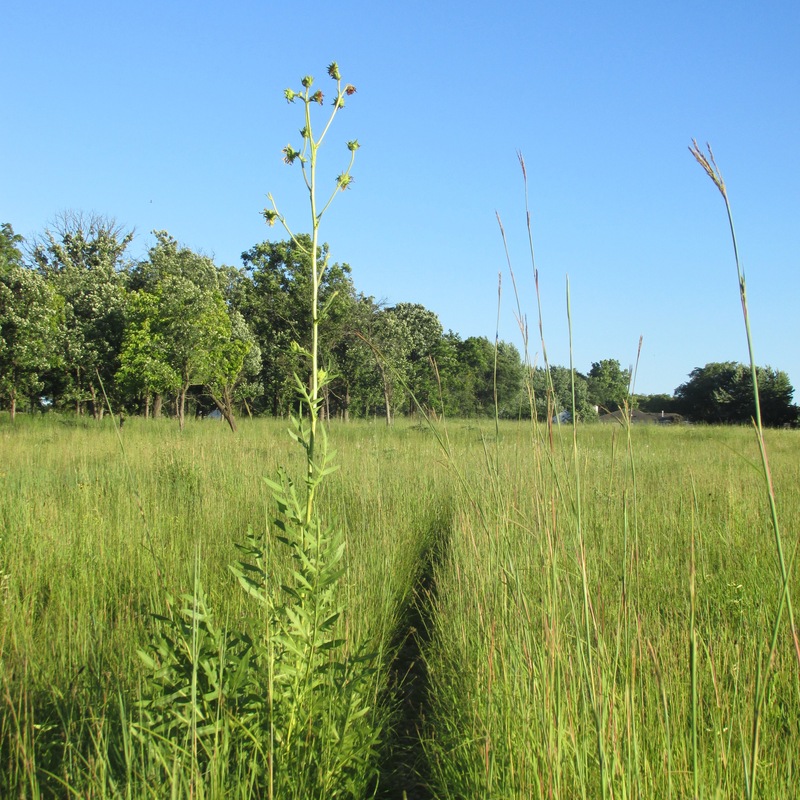 My prairie volunteers were working hard to hand-weed invasive sweet clover, giant ragweed, and other undesirables on a hot August morning. I paused from my own work, and looked. 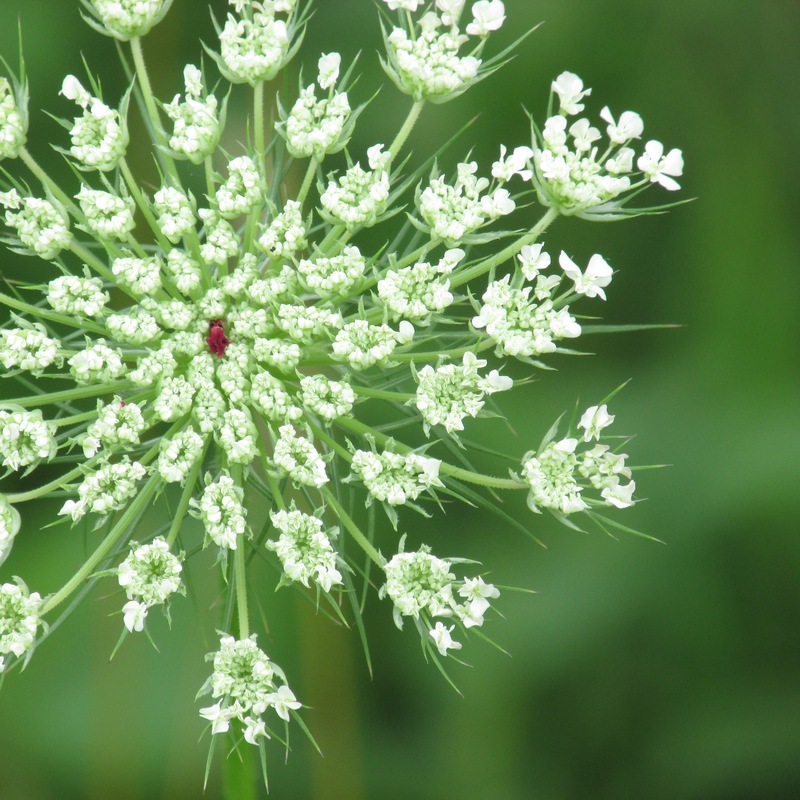 Yes, it was a noxious weed. 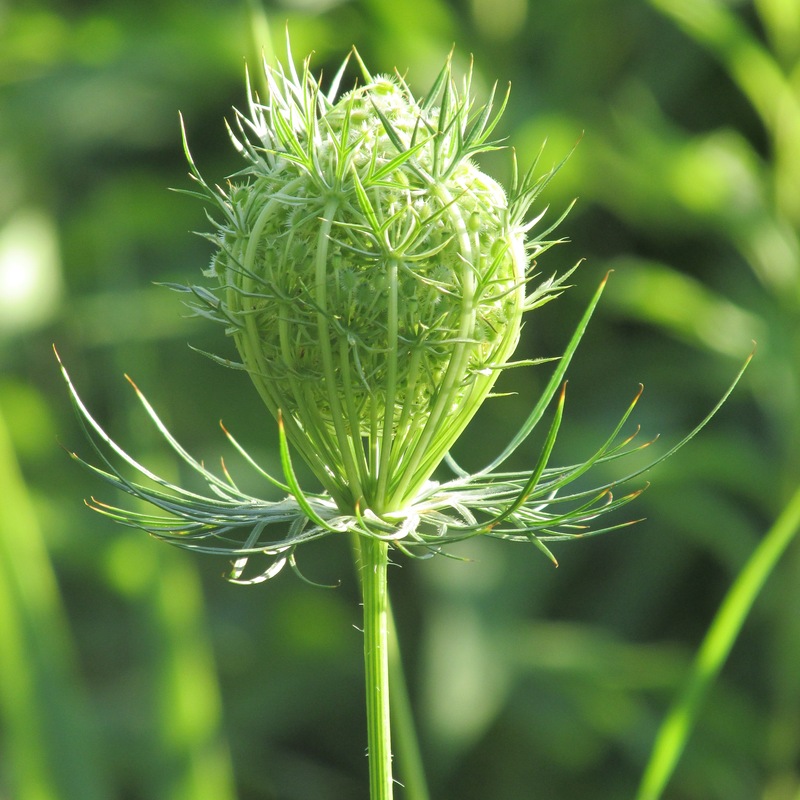 Daucus carota, or Queen Anne’s lace, is a familiar roadside plant in Illinois. 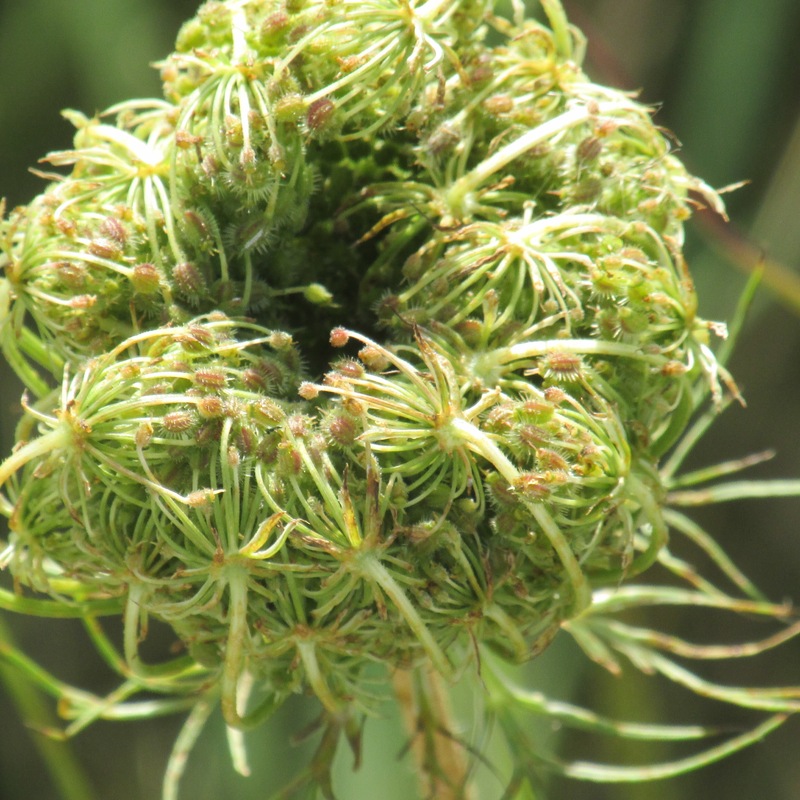 It weaves its way into almost every prairie restoration. 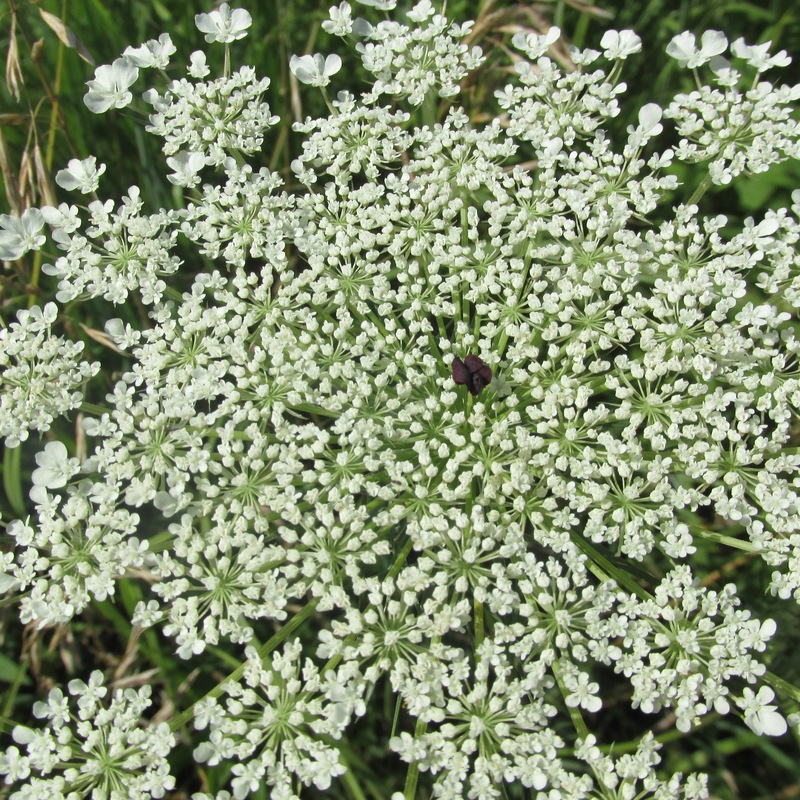 It’s in the carrot family, which isn’t a stretch to think about if you smell the carroty leaves or pull it up by its long, carrot-like tap root. 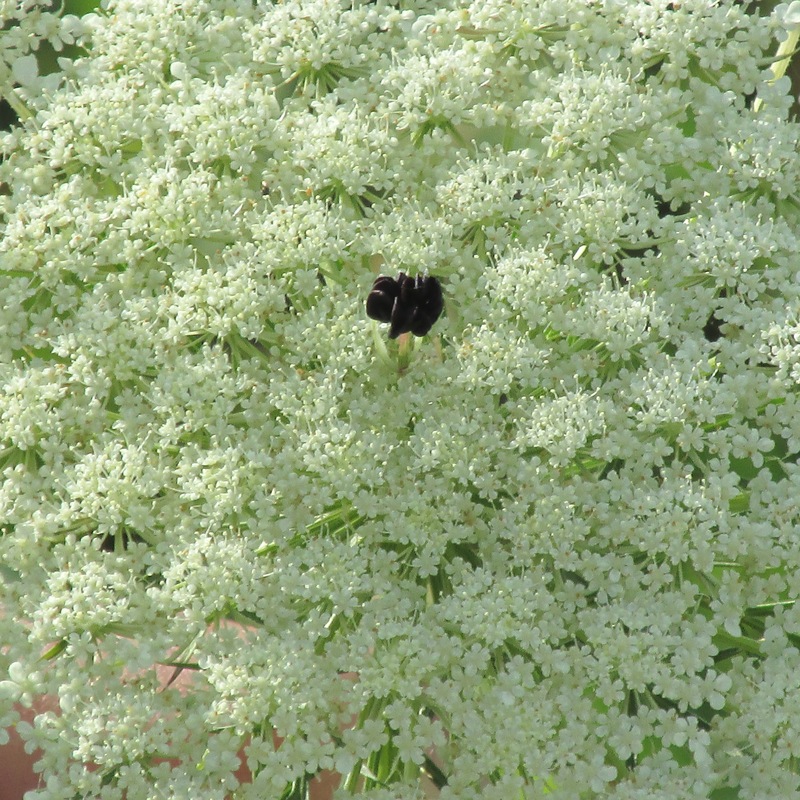 Some Native American tribes used an infusion of the blooms to treat diabetes. 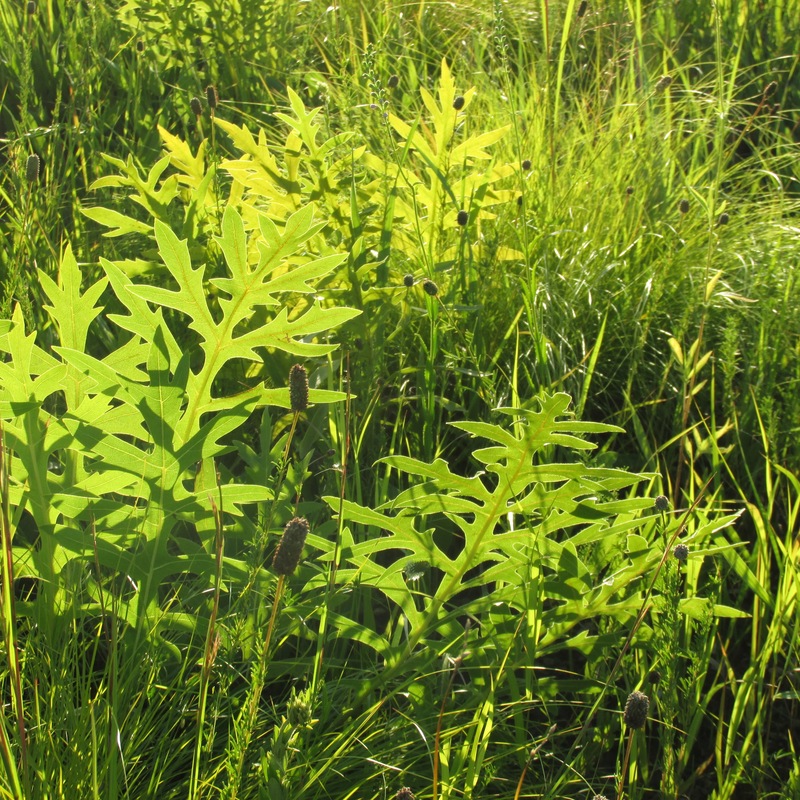 Others used the roots as medicine and food –with caution. 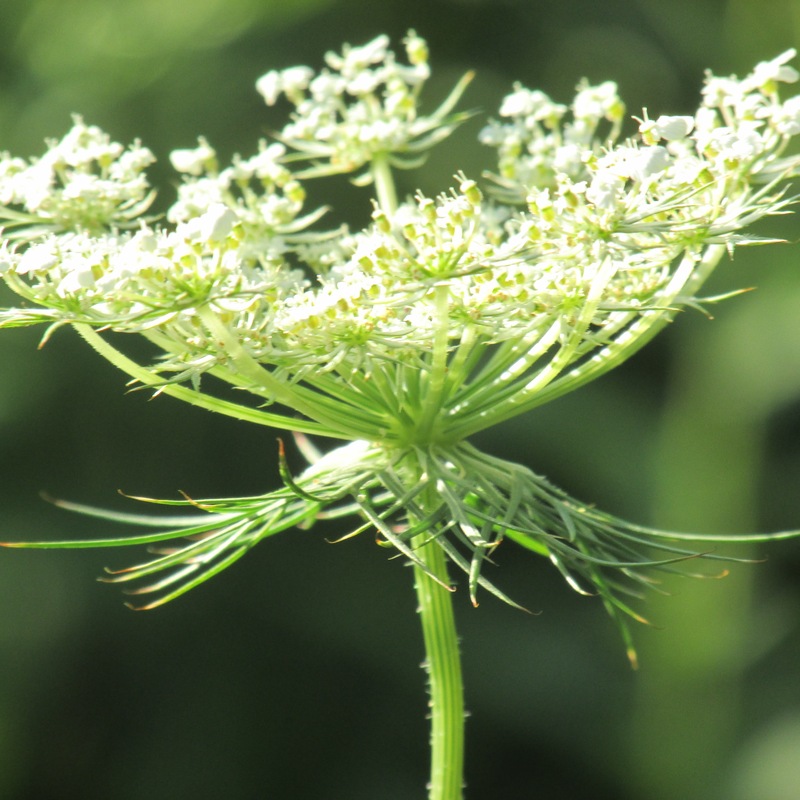 The plant somewhat resembles the poisonous wild hemlock. This bloom below has a little pink in it, almost like a pale prairie sunset with lots of white clouds. What do you think? 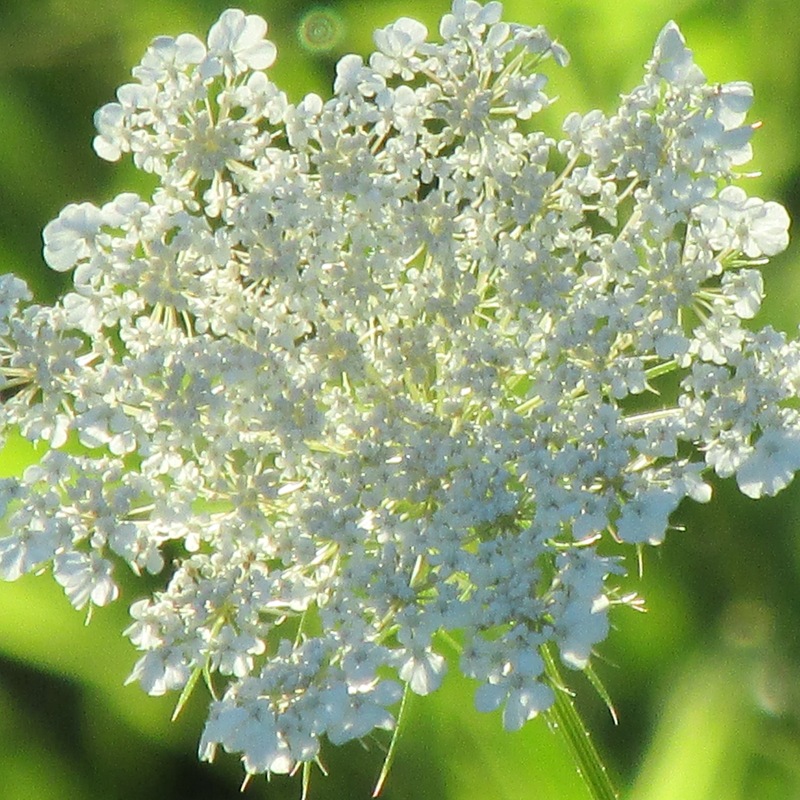 Queen Anne’s lace is as pretty as anything we grow in our gardens. I have a certain nostalgia about it, as the blooms were the summer backdrop for my Midwestern childhood. 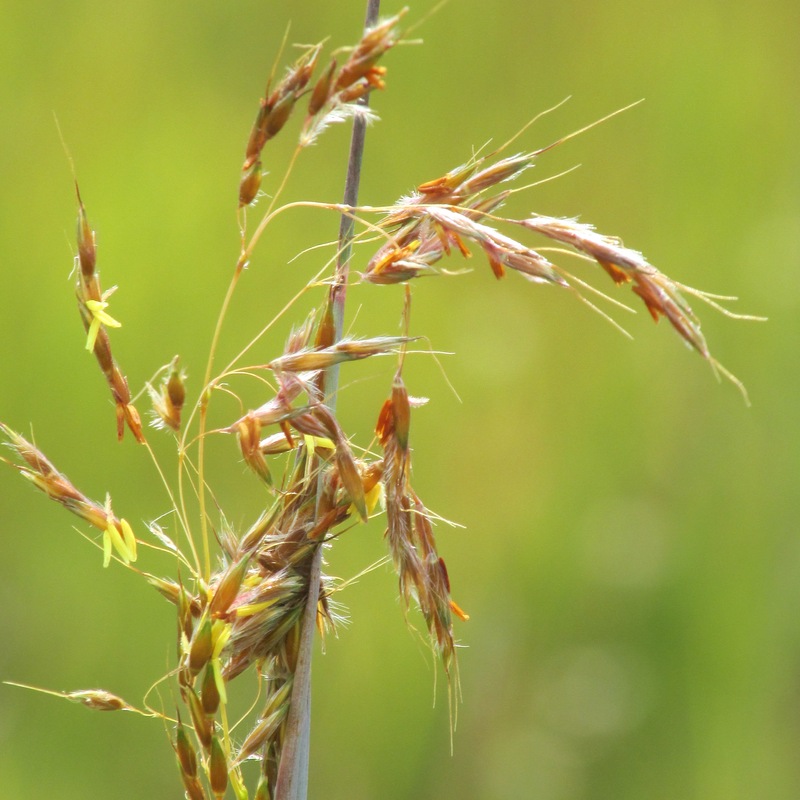 But it’s not native to Illinois, so technically, we should get rid of it in a prairie restoration. Look closer. See the tiny reddish purple center? 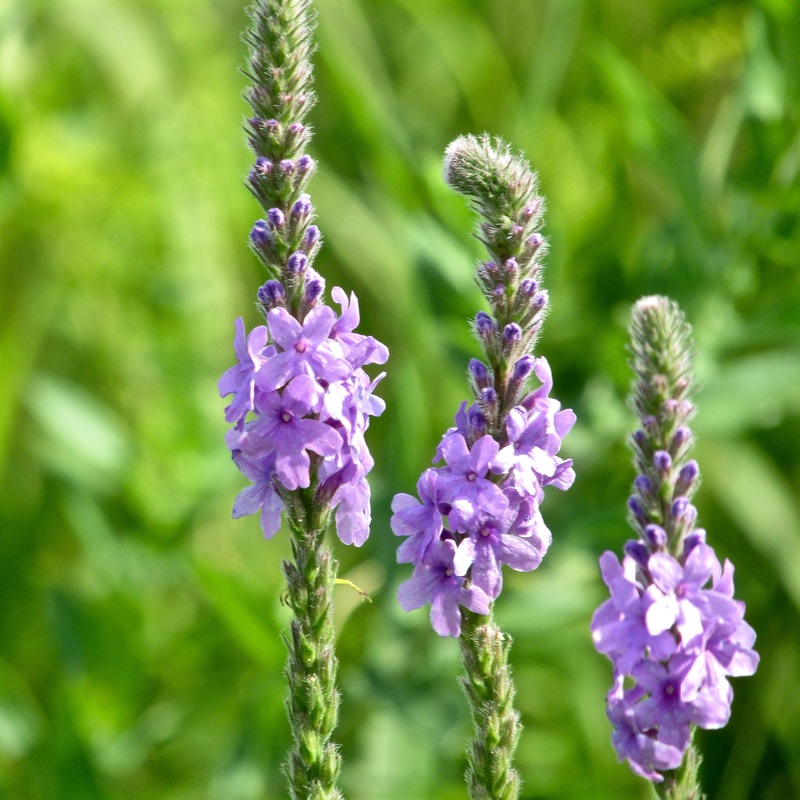 Most, but not all blooms have this. 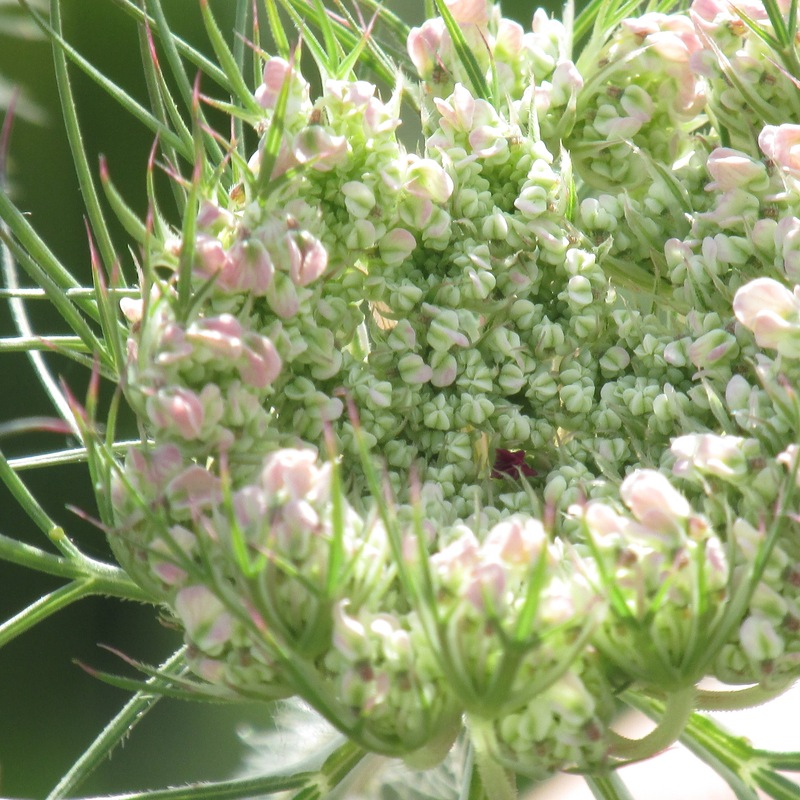 Folk tales say that the flowers are named for Queen Anne of England. As she tatted lace, her needle slipped and she pricked her finger. Ouch! A single drop of blood fell into the lace. It’s a great story. I love the “lace stage.” But that’s not the only time it attracts my attention. 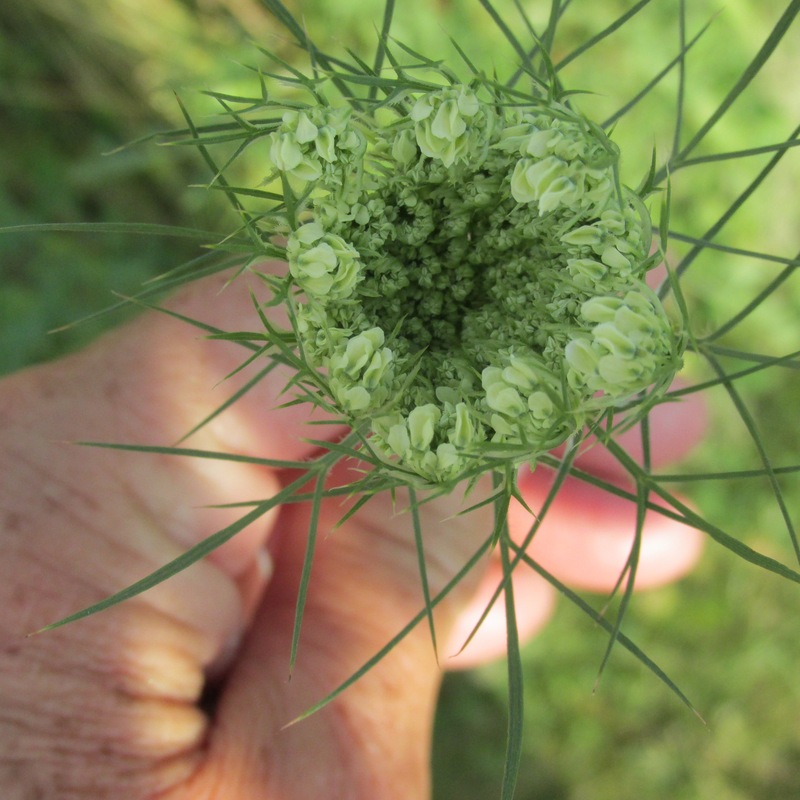 In its early pre-bloom stage, Queen Anne’s lace reminds me of a bird’s nest, or a tangled skein of yarn. Cut some, and the flowers last a long time in a vase, bringing a little bit of the outdoors inside. 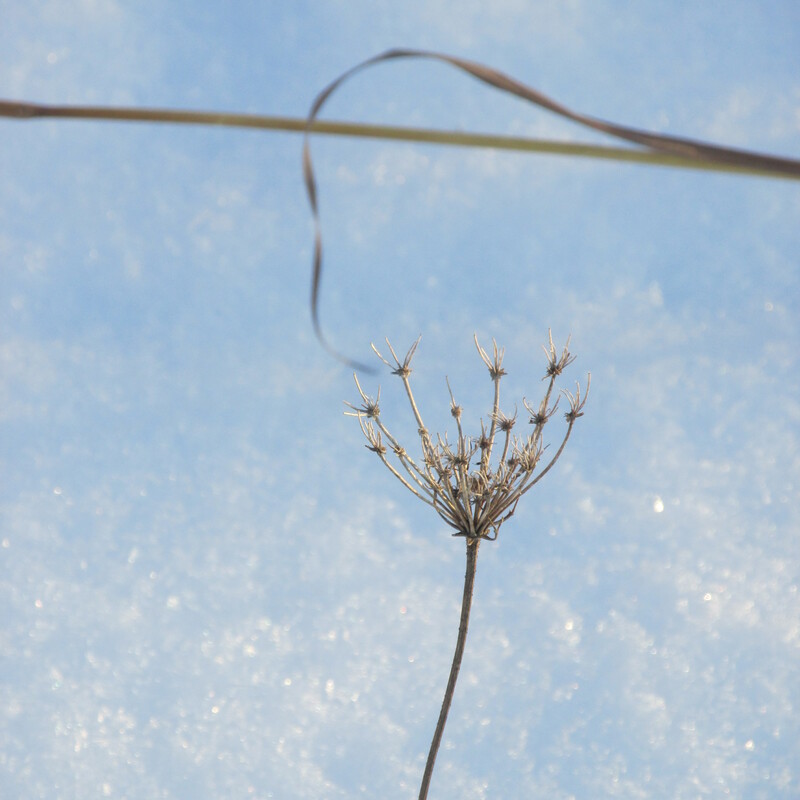 In the winter, the old Queen Anne’s lace is a familiar silhouette against the snowy prairie. Speaking of which…. Back to my volunteer’s question. Should we pull it? 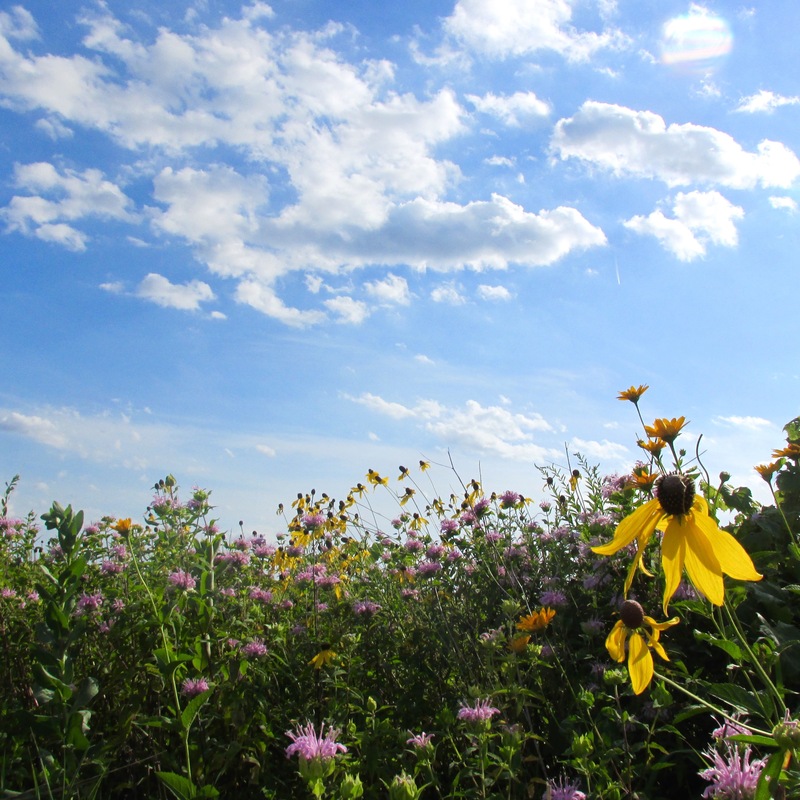 The prairie restoration we weed is more than 50 years old. 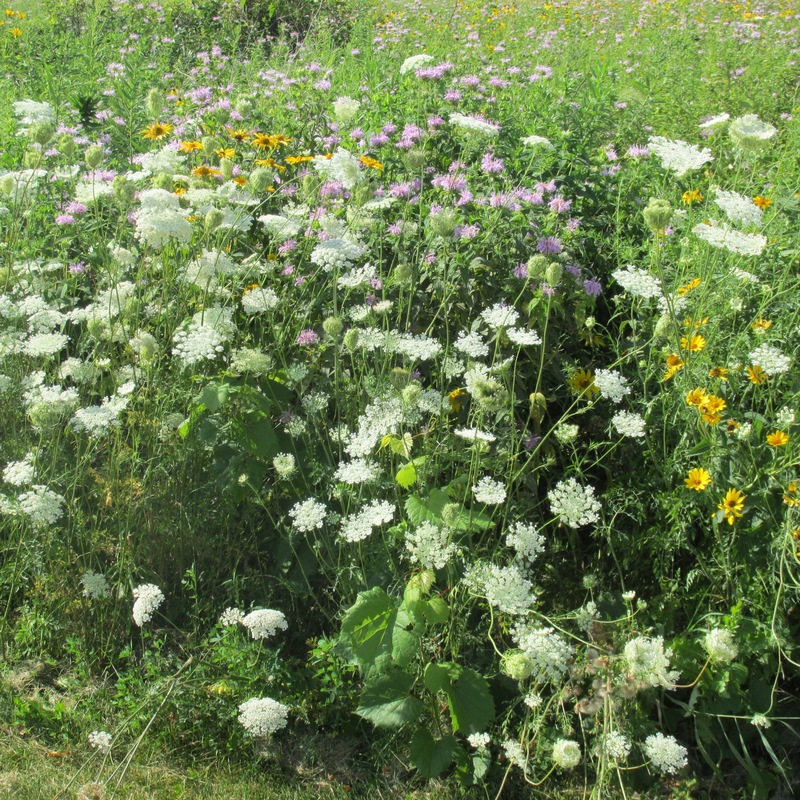 It is a tough, mature prairie, well equipped to withstand most invaders. 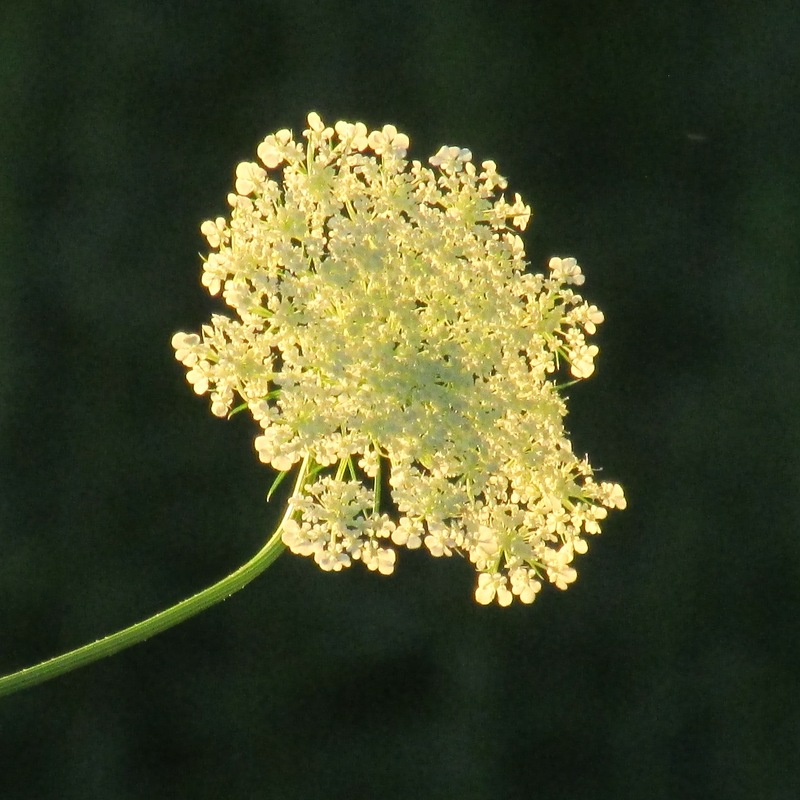 Queen Anne’s lace loiters around the edges. It’s seemingly too lazy to make a leap into the interior. I’m not usually sentimental about weeds, but I thought for a moment. Admired the blooms again. Maybe on another day we’ll pull it. Have you heard them? Listen. The crickets sing a rhythmic “shhh—shhh–shhh–shhh” like an oscillating yard sprinkler. Cicadas tune up. Summer hears the sounds and begins to exhale. July ends with a blue moon; the traditional name for the rare second full moon in a single month. August opens hot and stormy. 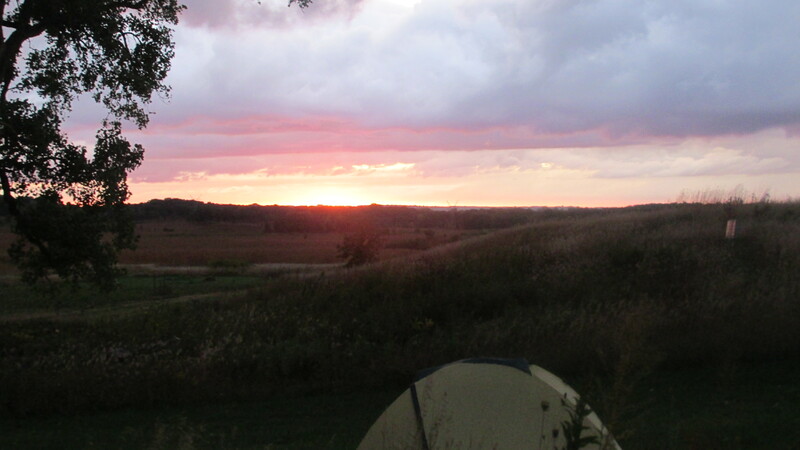 The prairie — responding to temperature, the slant of light, a million unseen signals it has tuned into since the dawn of time —begins to count down the days toward autumn. Urgently, it pumps out surges of color: yellows, purples, whites. 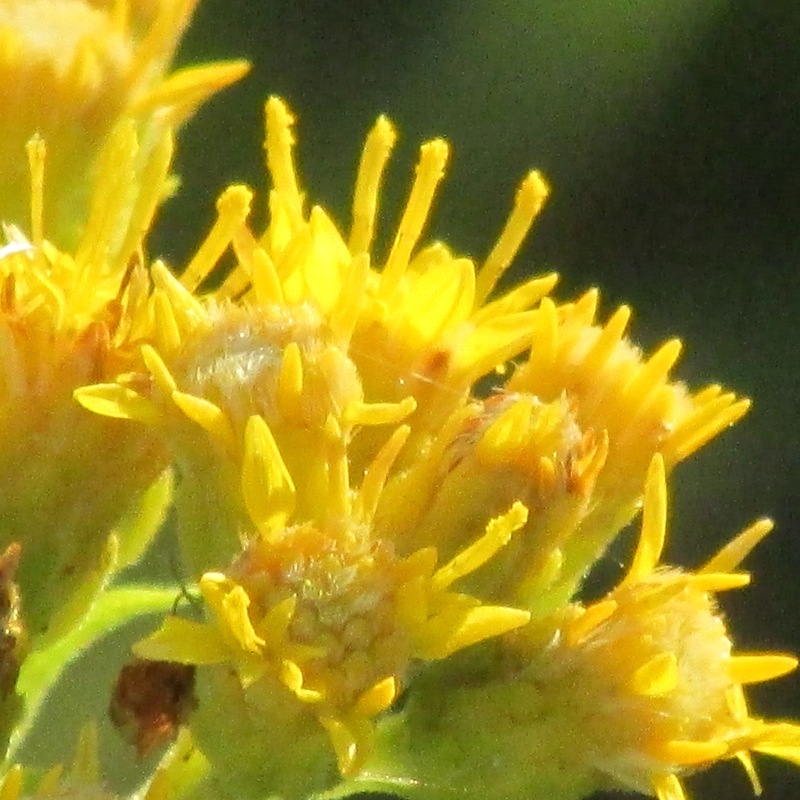 The first goldenrod bursts into bloom. 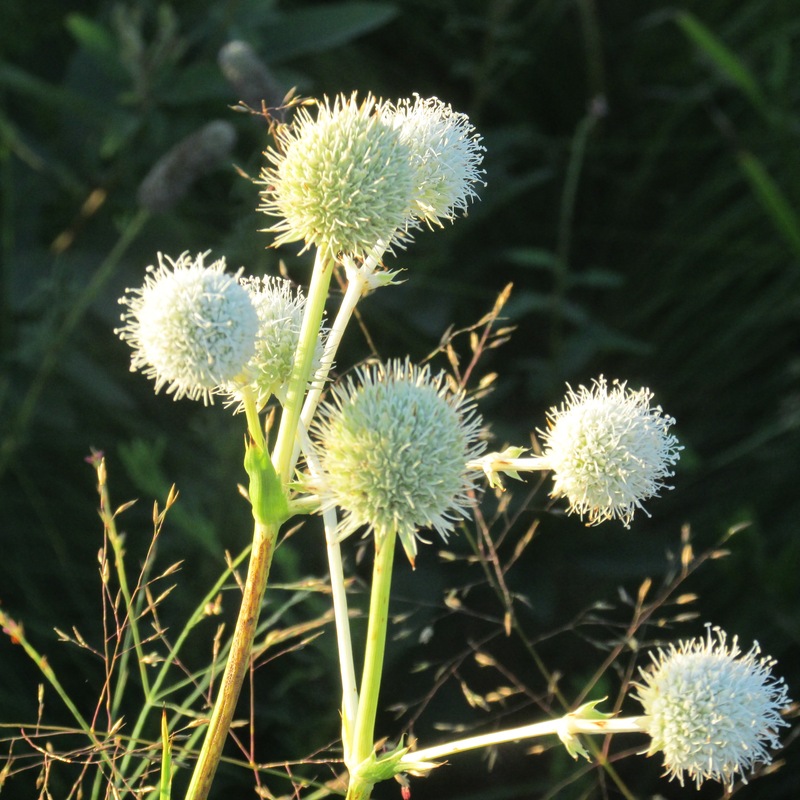 Rattlesnake master seedheads glow pale and prickly. 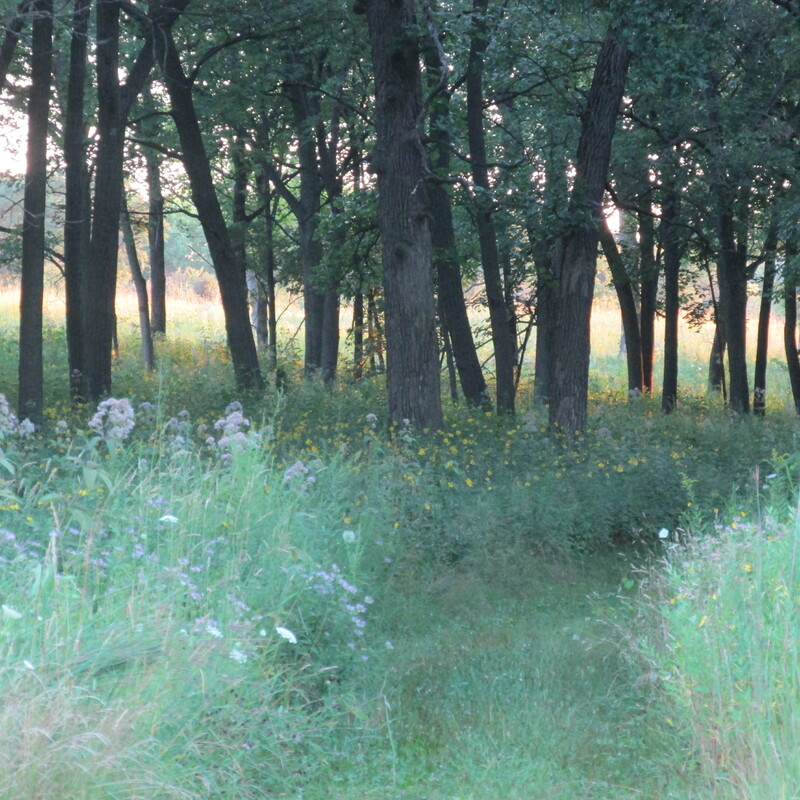 The fragrance of prairie dropseed permeates the air. Mmmmmm. Smells like buttered popcorn. 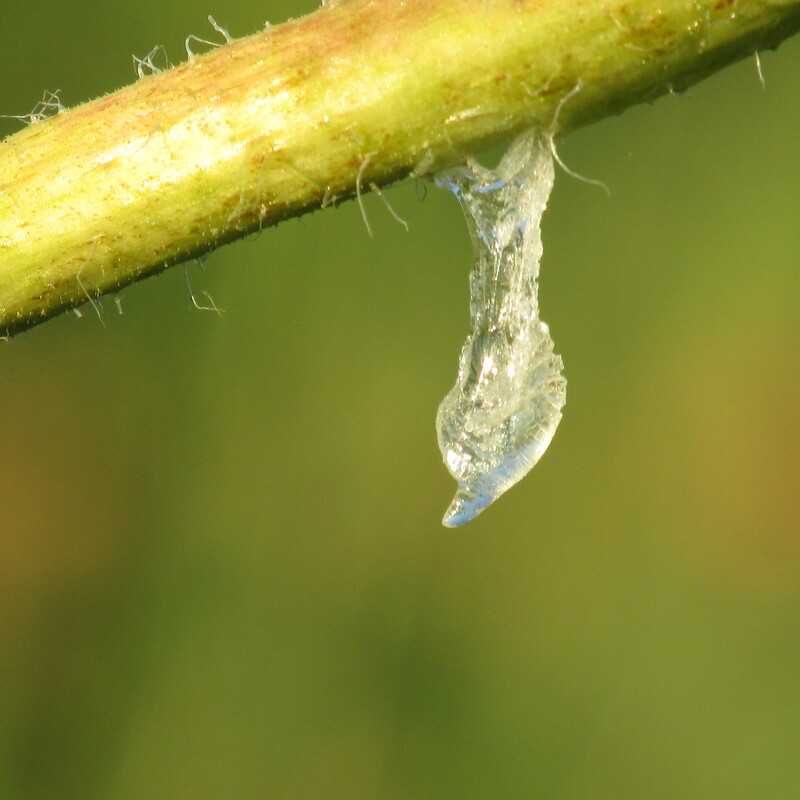 Compass plant sap drips in the daytime heat, then crystalizes in the cool August evenings. 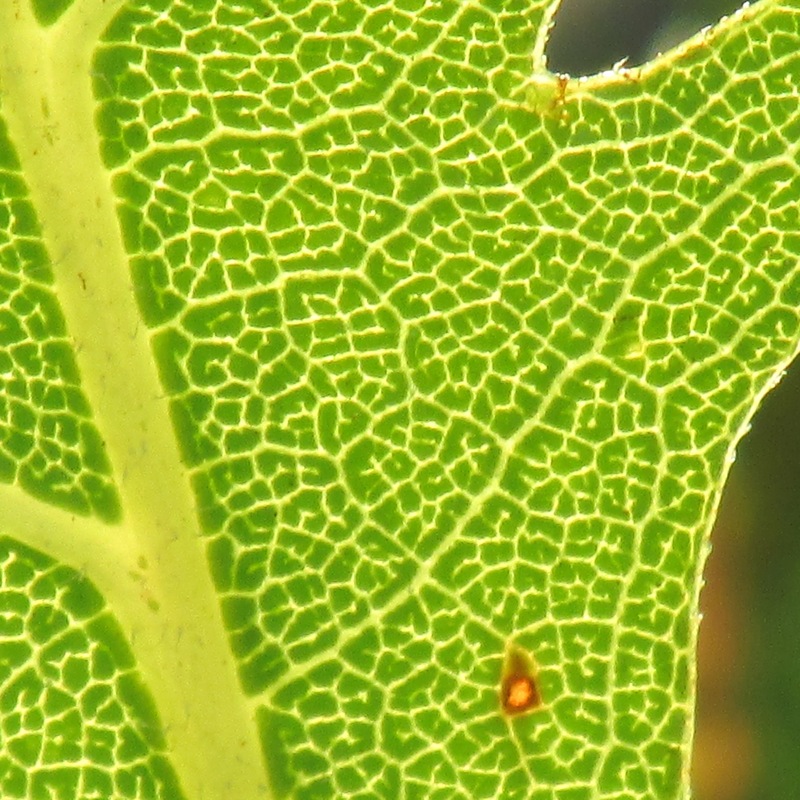 Native American children chewed the sap like Wrigley’s Spearmint gum. Dusk begins to fall. 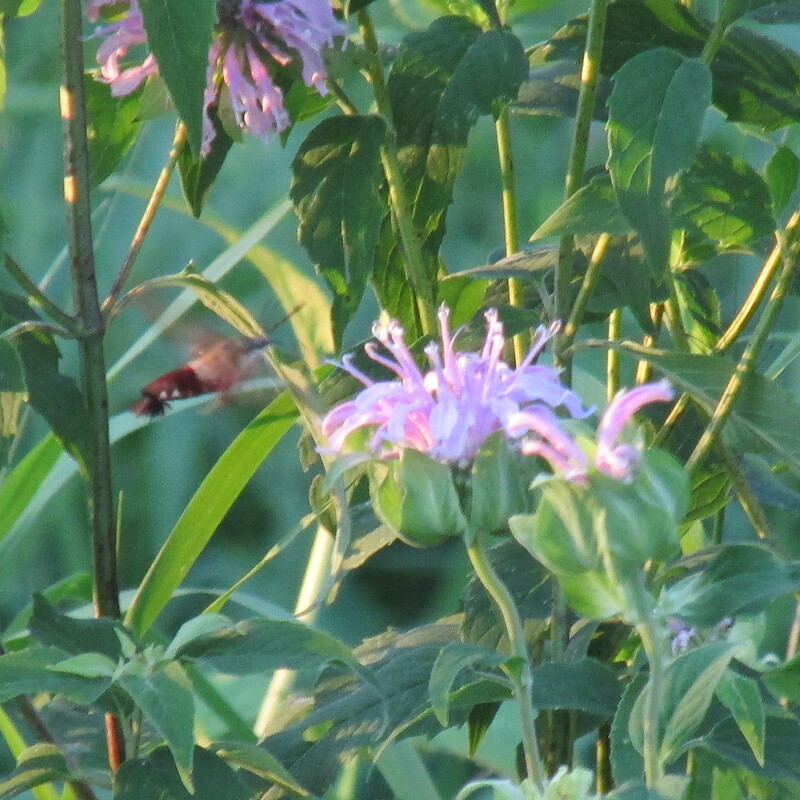 The hummingbird moths blur their way through lush stands of bee balm, fueling up for the night. 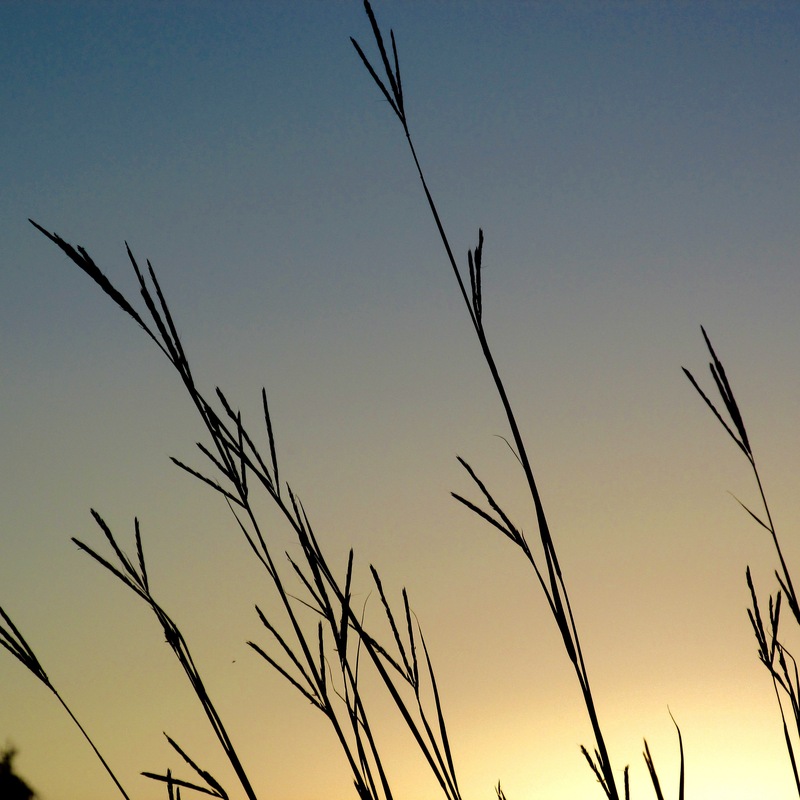 The first big bluestem seedheads unfurl, turkey-footed against the sunset. 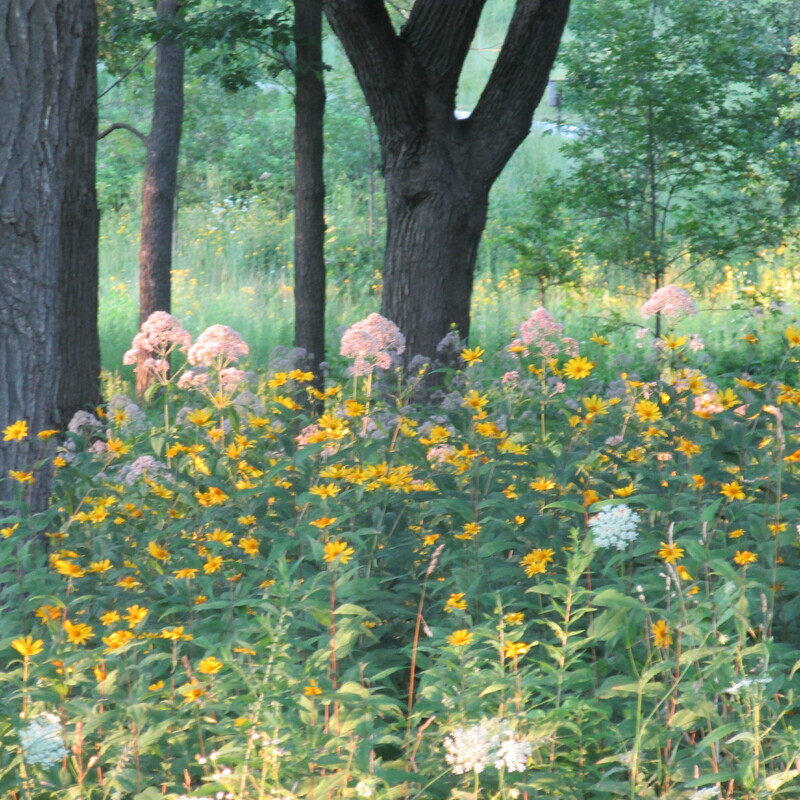 Turn the corner into the savanna and admire the Joe Pye weed, Queen Anne’s lace, and woodland sunflowers as they spread their tall carpet under the oaks. The grasses and trees become a little pixelled, a little grainy as the sun drops over the horizon. The cool breath of twilight rises up from the trail to meet you. Somewhere, a seasonal switch is flipped. A corner turned. Summer, we’re not ready to let you go. Please. Stay a little longer.